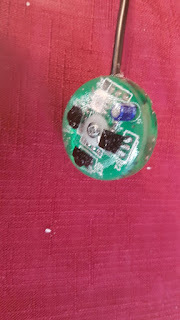 I've been trying to optimise the way I make Milestag sensor domes. Previously I have thermo formed acrylic sheet but this is very labour intensive. 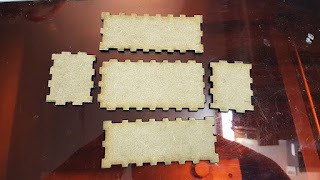 The acrylic sheet needs to be cut to size, heated in the oven, force formed, cut and sanded. In an attempt to reduce effort, I investigated using acrylic resin to encapsulate the sensor PCBs. Initially I tried dental alginate as a moulding agent. 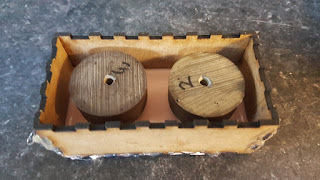 Using the formers my neighbour made (see link) I made some moulds. These appeared to be OK until I tried casting acrylic resin into them. The alginate when set and flexible has too high a water content and this interferes with the resin curing process. Simply leaving the alginate mould longer to dry makes it become hard and dimensionally unusable. 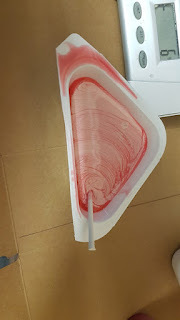 I then tried silicone mould making kit from amazon. 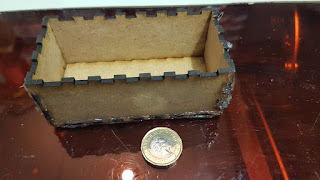 First I laser cut a box using Makercase that was large enough to hold the formers. I glued this together with a hot melt glue gun. This ensures the moulding material does not leak out when it is poured. The silicone kit comes with a white base and a pink hardener. This makes it easy to ensure it is mixed correctly. I use the larger part of a Muller corner yoghurt to mix in as the triangular shape makes an excellent pourer. 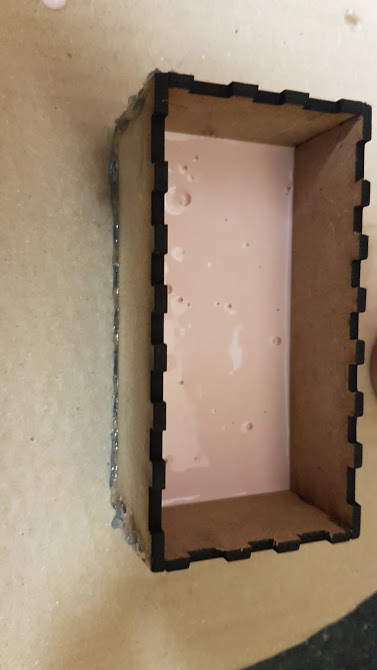 Initially I poured a 5mm layer of silicone into the box. This forms the bottom layer of the mould. I then placed two formers onto this layer, and filled with silicone. After the silicone had cured (about 12 hours) the box was broken away. I cut the mould in two and 3D printed a mounting jig to hold the sensor PCBs in place. I also drilled a hole in the side of the mould to allow the sensor cable to exit. This was smaller than the actual cable to prevent the resin from leaking. After pouring in the acrylic resin I left it to cure for 12 hours. The parts are easily removed from the flexible silicone mould. The acrylic seems to not fully cure at the interface to the mould, leaving a cloudy finish. However, a few tens of minutes exposed to the air and it clears nicely.